Love this watch! Have been searching for one like this for a while and it has arrived! The silver and gold are bright and really shine. This watch looks much more expensive then it was. The case size is just the right size and goes well with the sporty look. This will be my new go to watch, its just that nice! I love this watch and the price was unbelievable! My husband purchased another brand of watch for me. I had asked for a watch with a big face so I would be able to tell time. The watch was well over $500.00 yet only lasted a year before I had to send it off for a replacement. The store said it would take 6 weeks. I saw the Akribos XXIV watch and fell in love with it! It keeps perfect time, I can shower, swim, and do everything while wearing it. The two-tone colors matches every outfit. The watch looks classic but not overstated. The price was totally unbelievable! The only thing that I dislike is that I only purchased one ☝🏻. This is a lovely watch. Bold and sturdy. The face has a pearlized cast, the band's silver gleams, and the brushed gold has a rich contrast. I appreciate the ease in closing the clasp shut with one smooth movement and the fact it stays locked until the side bars are squeezed to unlock. For a woman, this is not a dainty watch. It definitely makes a statement. I do not know yet how well this watch will wear as I purchased it this month. It has kept good time and I find the dial easy to read. Durable and sturdy, this gorgeous watch was a definite hit with my wife. Looks much more expensive, and the two tone color will match almost any other jewelry. Just received my new watch today! Love it , gold/silver tone perfect to wear everyday. Nice quality, great value!! Received watch in about a week. Quality of watch was exactly as described. Came in a nice gift box witch was good because I got as a gift for my girlfriend. 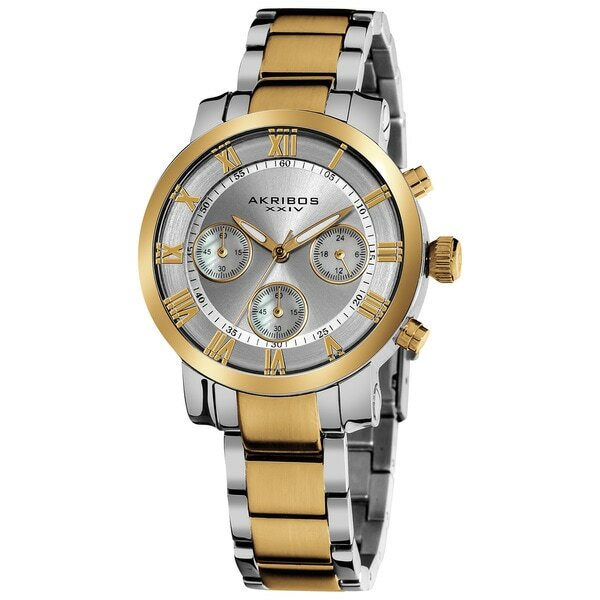 Great buy for the money, definitely recommend it if you are considering buying a watch for your woman. Great quality, looks very high end. 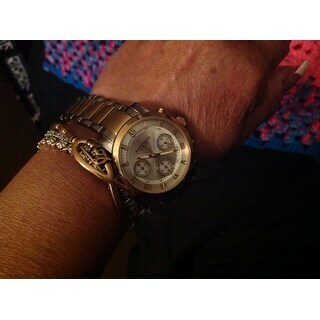 Love this watch since it is 2 tone and goes with either gold or silver jewelery. I like mine to be loose on my wrist so this fit perfectly. Would recommend to anyone who likes larger watches. This watch is my favorite Got one for myself and I bought two more for my daughters. They loved it. Looks very expensive. Good quality. I am highly pleased with my purchase of this watch. The quality is excellent and it is just what I was looking for. A stylish, high class, quality watch for a reasonable price. Beautiful but quite large. Will have to have some links removed, but for the price it’s worth it. If you like big watches, it’s for you! Just expect the large size, both in the bracelet and the face. "how big is this watch?" The case measurements are 36.5 mm wide x 36.5 mm long x 10 mm thick, and the bracelet measurements are 16 mm wide x 7.5 inches long. "How can the bracelet be lengthened. Does the 7 inches include the length of the case"
"Who/How can shorten the bands to 6.5 length "
I took mine to a jewelry store and they did in in a few minues and the cost was very low. If you have a jewelry store they will probably do it for nothing. Good luck. Love my watch!!!!! A local jeweler should be able to help you remove up to four links from each side of the bracelet. Japanese products have, for me, proven to be excellent, love the look and can wear as dress up with gold or silver. I think it is a good buy since I got a 91% off from original price.